Location: On N corner of Greyfriars' Road. Designed by Ernest Runtz and Ford, architects, of London (eg Gaiety Theatre). Plans submitted and approved in 1905, opened December 10 1906. Refurbishment of 1987-89 by Renton, Howard, Wood, Levin Partnership included works to auditorium, and enlargement of Foyer including new stair in bowed corner. Red brick with bathstone dressings (side wings painted). Curved corner block of three storeys beween polygonal turrets with octagonal cupolas, and volutes; balustraded parapet and modillion cornice above second floor colonnade of paired Ionic columns in antis. Three second and first floor windows with entablatures; three doorways and two flanking windows on ground floor. To Greyfriars' Road, 2 bays, then lower section with dormers and 15 windows at first floor level. Fire exit doorway has bracketed pedimented hood. To Park Place, three-storey wing in painted brick. Auditorium has square-headed and panelled proscenium arch with two bays of tiered boxes to each side, ornamented with giant Ionic pilasters and entablatures, the balcony fronts of the upper boxes each moulded in the form of a scroll, panelled and balustraded balcony fronts to lower boxes. Curved and panelled balcony fronts to Front Circle and Upper Circle. Auditorium ceiling divided into two large plaster panels which are ornamented with modillions, the panel over the larger part of the auditorium with four gilded wreathes and centre rose. Circular foyer. 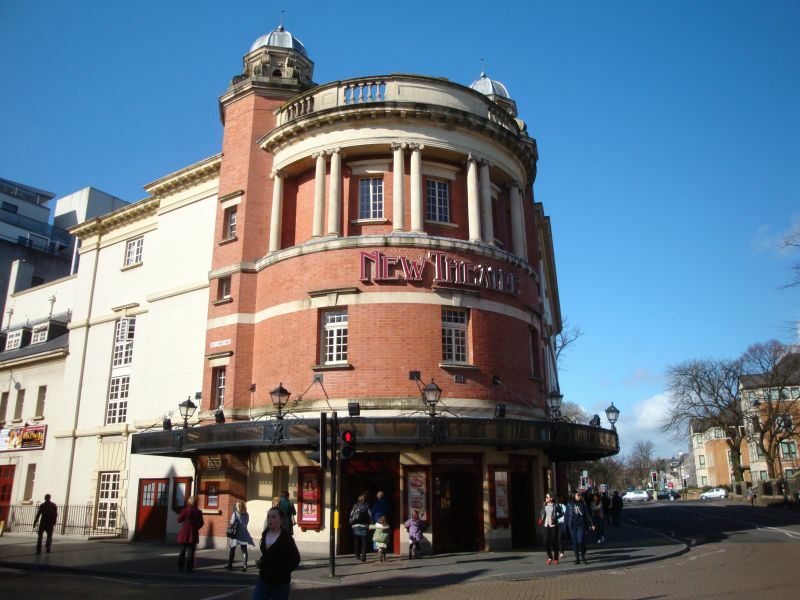 Well-preserved Edwardian theatre by leading firm of specialist theatre architects.